Welcome to the Advanced Mouse Manager home page! Originally created in August of 2015, Advanced Mouse Manager is an offshoot of the popular Mouse Manager Tray icon utility. 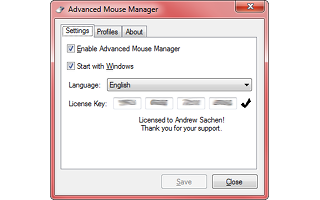 Specifically, Advanced Mouse Manager contains two advanced features which the original version lacks: Application-based Profiles and Translations. Advanced Mouse Manager is free to try for 30 days. If you enjoy it, please purchase the full program. A full license allows for installation on up to five computers! Please enter the name you would like to register under. Please enter a valid E-Mail Address for your License Key to be sent to. Notice: Your License Key will be sent to the E-Mail Address you enter above, not your Pay Service E-Mail Address! Already purchased Advanced Mouse Manager and need your License Key? 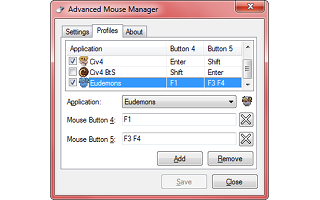 The purpose of Advanced Mouse Manager is quite simple. Most mice today have five Buttons: Left, Right, Wheel, and two more which usually are functionally the same as hitting the Back or Forward Buttons. Some games call these buttons Mouse 4 and Mouse 5. Advanced Mouse Manager takes advantage of the general disuse of these two extra buttons by letting you reconfigure what happens when you press them. Namely, it allows you to set these buttons to any keyboard key or series of keys you choose. So, if you set the Fifth Button to the letters H, E, L, L, and O, every time you press the Fifth Button on your mouse, your computer will think you typed "hello" on the keyboard. Each set of replacement commands, or macro instructions, for the Fourth and Fifth mouse Buttons are stored in a profile, and each profile can be enabled through the handy Tray icon. Advanced Mouse Manager lets you assign these profiles to specific applications, or to apply the profile across all applications. More specifically, the profile will automatically be selected when the program you select has the mouse's focus. So if you have one profile for "Google Chrome" and another for "LibreOffice Writer", the moment you switch to a Chrome window, your mouse will use the "Google Chrome" profile, and the moment you switch back to your open document, the profile will be switched to the one you assigned to "Writer". You can even set multiple profiles for one program and switch between them depending on what your task for the day is. The interface of Advanced Mouse Manager is extremely simple. Most of the time, you probably won't even pay attention to it after you've configured it, but the Tray icon will always be there in case you want to toggle a profile or turn off the program for a moment. The actual interface is opened with a single left-click on the Tray icon, which contains three simple tabs: Settings, Profiles, and About. About is self-explanatory, however it should be noted that the auto-update feature can be accessed through it. 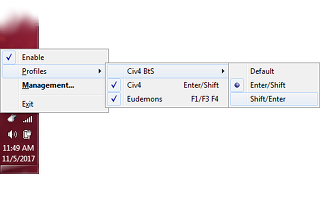 The Settings tab is also fairly simple: The first checkbox, labeled "Enable Advanced Mouse Manager" simply turns the functionality of the program on or off without having to stop and restart the program. If you ever need to go back to the normal use of your mouse, you can just uncheck this box and hit the "Save" button. Below that is the all-important "Start with Windows" checkbox: chances are you'll want this checked so you don't have to open Advanced Mouse Manager yourself every time your computer starts. And below the checkboxes is the Language selection dropdown list, which, as expected, will let you choose which language Advanced Mouse Manager is shown in. Looking for Translators: If anyone is interested in providing an Interface Translation in exchange for a free license of Advanced Mouse Manager, please contact me. The Profiles tab is where the "meat" of Advanced Mouse Manager resides, containing another deceptively simple interface. To create a new profile, simply hit the "Add" button. A new profile will appear in the Profile List at the top, and you'll be able to begin setting up the profile immediately. The first thing to do is select the appropriate application from the dropdown list of Applications. This list will include all currently running processes as well as a list of previously selected programs. The top of the list contains an entry that says "All Applications". A profile that applies to All Applications will actually apply for every application other than the ones another enabled profile is assigned to. At the bottom of the list, you'll see an entry that says "Custom...", which will let you choose an application by hand. Once you've selected an application, you'll notice the icon for it is displayed next to the dropdown list; if you click this icon, you can change the name which Advanced Mouse Manager uses for profiles which use the selected application. This can be extremely helpful for maintaining a clean and easy-to-understand profile list. 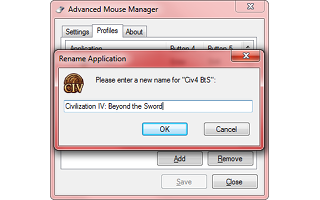 Next, click in the textbox marked as "Mouse Button 4" and hit the keyboard key or series of keys you want to occur when you press the Fourth mouse Button in the application you've selected. If you want to disable the Fourth mouse Button entirely, just hit the "X" button next to the textbox; the mouse button will do nothing in the selected application when pressed. Make your selections the same way for "Mouse Button 5" to assign commands to the Fifth mouse Button. When you've set the profile up the way you want, simply hit the "Save" button and close the Advanced Mouse Manager window. You may have noticed that each profile in the Profile List has a checkbox next to it. This checkbox lets you turn a profile on or off, or lets you choose one of many profiles if you create multiple profiles for a single application. The same options are available through the Tray icon via the right-click menu: simply open the "Profiles" menu item and all of the applications you have profiles for will be listed. Any application with only one profile will also display the actions of the profile; simply click on this menu item to turn the profile on or off as the checkbox displays. If the application has multiple profiles, a sub-menu listing the profile commands for each profile will be shown, as well as a "Disabled" option. Click on one of these menu items to choose profile you want to use, or to turn all profiles for the selected application off. Advanced Mouse Manager is free to try for 30 days, and a single license is valid on up to five computers at the same time, so try it out today! And as with all my programs, you can ask any questions in the Comments section below, or contact me directly for assistance, even if you haven't purchased a copy! This product is provided under a commercial license without warranty. You must accept the product's license during the installation procedure as part of these terms. RealityRipple Software is not responsible for your computer's functionality, or for any issues incurred from this product. RealityRipple Software is not responsible for any unavailability caused by regular updates to the website or underlying system, including the Web Server, PHP, MySQL, PayPal, or any associated technologies or services. RealityRipple Software is also not obligated to provide reimbursement for any downtime. Refunds may be requested within sixty (60) days of payment, as per PayPal's terms. Cryptocurrency refunds (minus transaction fees) available for the amount paid, regardless of fluctuations relative to other currencies. The time limit remains the same. RealityRipple Software will not will not give, sell, or otherwise transfer any provided account data to any other party for any purposes, including but not limited to initiating, or enabling others to initiate, unsolicited E-Mails. Questions, comments, and other requests may be handled via the RealityRipple Message Boards, E-Mail, or the Bug Tracker system. How many times can seven go into fourteen evenly?